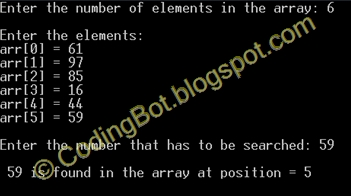 As I have already described what are Arrays and their basic creation C code, in this post, we'll learn how to perform Linear Search In An Array, its Algorithm And C Code. In computer science, linear search or sequential search is a method for finding a particular value in a list, that consists of checking every one of its elements, one at a time and in sequence, until the desired one is found. Linear search is the simplest search algorithm; it is a special case of brute-force search. Its worst case cost is proportional to the number of elements in the list; and so is its expected cost, if all list elements are equally likely to be searched for. Therefore, if the list has more than a few elements, other methods (such as binary search or hashing) will be faster, but they also impose additional requirements.